Ongoing analysis of sensor data and recovered debris indicate the deadly breach in the shuttle Columbia's left wing was located slightly outboard of the best previous guess, possibly at or near the intersection of leading edge panels 8 and 9, investigators said today. Recovered debris from that area shows damage consistent with extreme, prolonged heating and matches up well with telemetry and recorded data showing unusual temperature increases in the early phases of the shuttle's catastrophic re-entry. The Columbia Accident Investigation Board also revealed today that investigators are now focusing on a so-called T-seal, part of the leading edge system, as a possible candidate to explain a mystery object seen floating away from the shuttle on the second day of its mission. Board members initially believed the object might have been a tiled access, or carrier, panel that somehow shook loose following impact by a piece of foam debris during launch. But testing at Wright Patterson Air Force Base to determine the radar signature of various potential debris candidates does not match up with a carrier panel. In addition, search crews have now recovered fragments from all of the carrier panels originally located behind leading edge panels 5 through 10. Engineers now plan to test a variety of components, including a T-seal, a large fragment of a reinforced carbon carbon - RCC - leading edge panel and other leading edge components to find a better match with the radar data. "Given that we have found pieces of all of the carrier panels in this region, it's looking less likely that was a drift away object, although it could have been an impact zone," said board member Scott Hubbard. He said ongoing analysis of launch video shows a large piece of external tank foam insulation struck Columbia's wing between RCC panels 7 through 9. Recovered fragments of these RCC panels show slag-like deposits on their inner surfaces, presumably the result of a plume of super-heated air melting underlying components and splashing molten material on nearby components. "Data is emerging that shows very significant and unusual damage at the interface between (RCC) panels 8 and 9," Hubbard said. "For example, the splattered metal on panel 8 is much heavier than elsewhere and there is erosion of the reinforced carbon carbon elements, the ribs, what's called the lug where the attachment occurs. 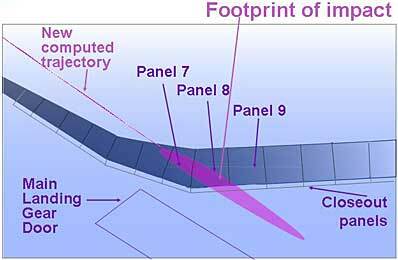 Temperature data from the OEX recorder recovered March 19 shows severe heating in the cavity just behind RCC panel 9 and "we have the debris speaking to us and saying something severe happened in the interface between panels 8 and 9," Hubbard said. Even so, he emphasized other explanations might be possible and "this story of exactly what happened and where it happened, while we're closing in on it, is going to continue to evolve." In the meantime, engineers are gearing up for a critical series of tests at Southwest Research Institute in San Antonio to validate or disprove the leading suspicion about what caused the disaster: The impact of foam debris 82 seconds after liftoff. Using a nitrogen gas cannon, engineers plan to begin firing foam at representative heat-shield tiles by the end of the month. By mid May, a leading edge mock-up, including RCC panels 6 through 10, will be ready for impact tests. Panels from the prototype shuttle Enterprise will be used on the mockup, along with flight panels from the shuttle Discovery that closely match Columbia's panels in terms of age and flight experience. The idea is to fire foam closely matching the debris from Columbia's external tank at leading edge components at some 500 mph to determine what sort of damage might result. Of special interest are the T-seals bolted to the front of the wing spar that form the interlocking framework holding the RCC panels in place. The T-seals, in turn, are held in place by two bolts at each end and it's possible to lose or break a T-seal without breaking an adjacent RCC panel. "The space between panels 8 and 9 happens to line up with where the T-seal is," Hubbard said. "So that has become a suspicious region. 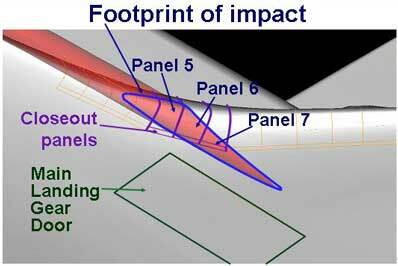 And in the preliminary planning for the impact tests, we're putting strong consideration on hitting not the middle of a panel, but that intersection where the T-seal is and seeing what happens, what kind of damage would be caused." Board chairman Harold Gehman said a lost T-seal would leave a slot-like gap between adjacent RCC panels. That gap could be an inch or more in width, providing a direct path into the leading edge. If a T-seal was damaged during launch and somehow separated from Columbia on the second day of the mission, the left wing would have been vulnerable to hot gas intrusion during re-entry on Feb. 1. Engineers now are running complex calculations to determine if a slot-like initial breach can explain the entry data and observed debris damage. "The jury is still out on how much of a breach you would have to have in order to create the effects you see, in particular the understanding or the feeling, from the visual data that we may not be dealing with a round hole, but instead something that created a long narrow slit," Hubbard said. "So the thermal dynamics people have gone back to the drawing board to figure out what a long, narrow slit would do as distinguished from a hole." The search for Columbia's wreckage is now drawing to a close. Underwater searches are virtually complete, grid searches on land have covered 78 percent of the primary debris field and aircraft searches are 80 percent complete. More than 70,000 pieces of shuttle debris have been recovered, representing about 78,000 pounds or roughly 36 percent of Columbia's dry weight. In early May, NASA plans to shut down its Disaster Field Office in Lufkin, Texas, and to consolidate remaining recovery efforts at a Columbia Recovery Office at the Johnson Space Center in Houston. In addition, four Incident Command Posts managed by the U.S. and Texas Forest Services will be closed by the end of the month.